And so another really great episode of Miami Medical airs (Diver Down) and you have to wonder what on earth CBS were thinking to pull the plug so soon. RATINGS UPDATE: Miami Medical once again had the highest viewing figures for Friday night, and was up from 6.14 million viewers last week to 7.04 million this week. Like last week, we’ve been treated to an excellent episode that should have fitted into early season 1 of the show. So we’re still character building and getting insights and teases about the team individually and the dynamics. What a shame this didn’t air in its intended position, there was so much to enjoy. Written by Christina Kim, it was a great showcase for all our characters, with Eva and Chris flirting, Serena having one of her best episodes, Tuck gently supporting and my wonderful Proctor keeping everyone guessing. A really strong episode. I’m afraid I misled you slightly in my preview: Diver Down didn’t tie up the Drs Proctor and Sable storyline (that’s to come next week, I think), but there was a rather fun subplot involving Proctor and a very different blonde lady. Chris’s theories about her identity range from the sublime to the ridiculous as a mysterious man with an envelope packed with cash arrives at MT1, and the money gets handed to the beautiful blonde. Of course, we all have the benefit of the episodes that come after this one (or would have done, if you know what I mean) and we know our man Proctor well enough to be able to discount Chris’s wilder speculations. Had it aired in early season 1 it would have been a much more effective tease. As it was, it was fun! Lis Harnois as Serena Warren does a great job this week, and she’s given both the meatiest part of the story, and a fun subplot involving her texting only relationship. 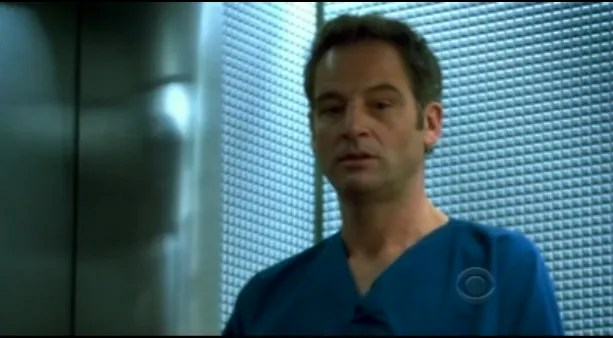 The idea of the lock in and countdown with Proctor and Serena working together, one on the inside and one on the outside, works really well, and when one of the patients inside the chamber turns out not to have the bends but something other and much more serious, things get very interesting. This intense and exciting situation is cut with lighter moments, and in one, Proctor conducts another outdoor bicycling consult, with Chris and Eva, to try to solve the mystery of the patient in the chamber. The solution involves something that links in nicely with an admission by Eva earlier in the episode. Both Proctor, and particularly Chris, are deeply intrigued by this, and the gentle flirtiness between Eva and Chris throughout the episode fizzes beautifully. I have to say that the omission of some of the episodes from the originally planned season has been to the detriment of some of the characters, and in particular I would say that Mike Vogel’s Dr C (and it’s no reflection on Mike’s skills as an actor) took longer to make an impression as a result. Guadaloupe? That's not my name! I have to mention the comic cameo from Jonathan Runyon as Paramedic Kleebus. Bravo, it was hilarious, though I’ll be happy if I never encounter him should I be seriously injured and minus a body part! A very enjoyable episode. If I have any criticisms (and really, they’re tiny), I would say that there were so many intriguing subplots (missing fingers, mysterious blondes, tattoos, Serena’s text relationship) that possibly the patients and their stories (with the exception of the hyperbaric chamber) were not as hard hitting as they sometimes have been. 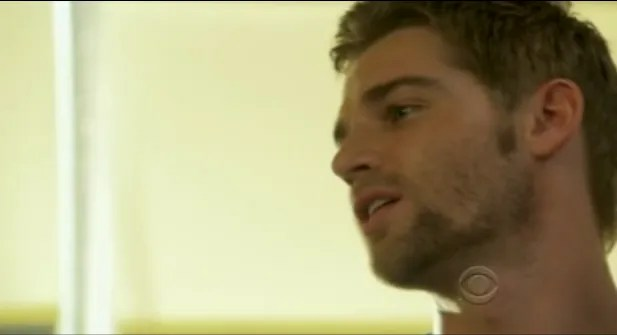 Although Mike Vogel acted his socks off in the scenes with his patient (I loved his explanation of his charm technique) for me, he wasn’t getting a performance in kind from the actor playing the patient. And I’m afraid my schmaltz-cringe button was hit during the scene with Brandon and Tracy and their salvaged engagement ring. I can’t help it, I’m British, and we don’t do ‘being there for you’. That apart, the interplay between the characters was great, the dialogue some of the best I’ve heard, the episode was perfectly paced, and there were excellent performances from Lis Harnois and Mike Vogel, with Lana, Omar and of course the sublime Jeremy assisting beautifully. 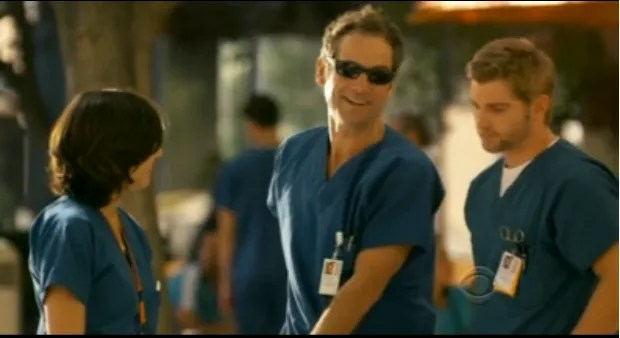 The episode was directed by Paul Crane, who has worked on ER. Great job, everyone. “Time of Death” — The personal lives of a boating accident’s victims cause havoc at the hospital while Dr. Zambrano finds herself in a tight spot following the arrival of Dr. Deleo’s brother, on MIAMI MEDICAL Friday, June 18 (10:00-11:00 PM, ET/PT) on the CBS Television Network. Bailey Chase (“Saving Grace”) guest stars as Rick Deleo, Dr. C’s brother. Michaela Watkins (“Saturday Night Live,” “The New Adventure of Old Christine”) guest stars as Carla, a trauma patient. 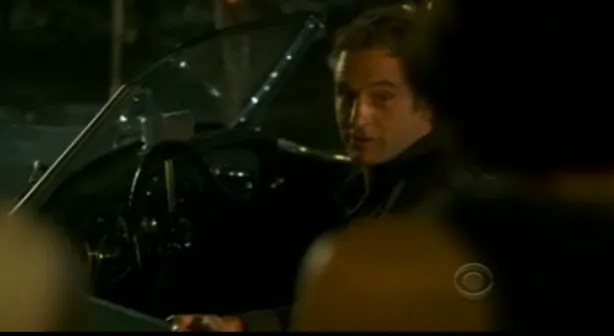 Eric Lutes (“Caroline in the City”) guest stars as Greg, Carla’s ex-husband. My comments are always the same. A very unfair use of this pilot, not giving the audience the full opportunity to get into the full personalities and storyline of the main characters. Each episode is excellent unto itself. I will continue to enjoy the remaining few episodes as will our friends. Being involved in the opportunity to voice opinion, I get a little satisfaction out of voicing feelings that so many are having but not letting you know. You shouldn’t really need this feedback as the show speaks for itself. The show is now being shown at a reasonable time, 11:00 p.m. was jsut too late for many. A pilot should never be aired that late. Have a great week. Thanks for your comments, Paula. I’m sure that the people at CBS who are looking in will be taking note of everyone’s views. Thanks Gill! My sentiments exactly! It is a shame these episodes were not shown in the proper order. This was another great episode and a solid building block re: character development and interaction among the characters. It boggles the mind why CBS invested so much time, energy, and resources into this solidly entertaining show and then, deliberately, made sure that it would not succeed (i.e., be in the lineup for next year). All the actors, writers, directors, etc. should be very proud of their work on Miami Medical. They did a marvelous job. Too bad CBS was unable to recognize that. And now, as a former ER addict, there is NO medical show to watch. House (bless Hugh Laurie – he’s a fabulous actor) is such a nasty character I just can’t watch. Plus, the show is much too formulaic for my taste. Grey’s Anatomy is a soap opera. Miami Medical was not an ER clone, but with the focus on medicine, interesting characters, and fast-paced story telling, it filled the void left by ER. Just three episodes left . . . what a terrible shame. I’m not a House fan. I like Hugh well enough, but he’s not an actor of Jeremy’s calibre. Before House, he was known for comic acting and sketch shows in UK. He’s not got the acting experience, training and theatrical background that Jeremy has. But, as Mary says, 3 more episodes to enjoy, so we’ll look forward to them. It would be lovely to think that somebody, somewhere might air ALL of the episodes in the proper order…I’m looking at you, BBC! You may have posted this already and I missed it, but do you know what order the episodes were supposed to go in? I’ve been taping them on vhs tape and would like to transfer them to dvd in the order that makes most sense/that they were supposed to be in. Unfortunately I’ve already transferred the first two episodes and have taped over them, so can’t rearrange those two, but the rest I haven’t transferred yet. Thanks Joan! Of course, I should have known you’d be the person to ask! Do you know where the extra episodes slot in in terms of where they *should* have been shown had we had a 13 episode season? Like a Hurricane, for example, I think should have been shown after 88 Seconds. I’m not absolutely sure, Elsie, but I’ll see if I can find out…. Hi Gill, in your excellent review you mention Proctor`s reaction to Eva`s tattoo. I haven`t fully grasped it, please can you explain it to me? I think I did miss a funny moment, didn´t I? You did, Martina! My favourite moment is when Eva reveals she has a tattoo in ‘big block letters’. She and Proctor (and others) are in the elevator. The doors open just as she says it, and everyone leaves, except Proctor who is thinking, and repeats ‘big block letters’ to himself. Jeremy’s reactions, his face, that’s what makes it so funny. That’s my favorite moment, too, Gill! “Big, block letters…?” You can see that what’s going on in his mind is not quite G-rated. Even my husband laughed! Thans for enlightening me, Gill. Now I can interpret his great grimace, so cute! Really, DocProc`s loveable, fascinating character has a huge potential and it`s such a shame to waste it! What marvellous storries the authors could have created about an around him! Wished I were a writer, but I`ve to be content only with my imagination and to hope for a DVD. You’re welcome, Martina. It’s a great moment, and I’m very grateful that we got to see it.